Having read my review of Brenda Webb's Fitzwilliam Darcy An Honourable Man I am guessing you want to read it? Well Brenda has very generously offered to give away THREE copies of it! A choice of paperback or kindle ebook for US/UK residents, and kindle ebook for other countries. 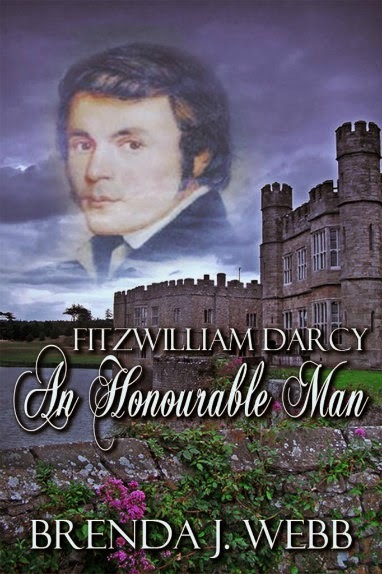 Fitzwilliam Darcy, An Honourable Man is a Pride and Prejudice variation. Not a simple retelling, it is an intriguing new story. Leaving England after his disastrous proposal was refused at Hunsford, Darcy spent two lonely years in Scotland and Ireland before returning home to face Elizabeth Bennet, certain that he could regard her as an indifferent acquaintance. The giveaway has now closed for entry and winners will be chosen soon! 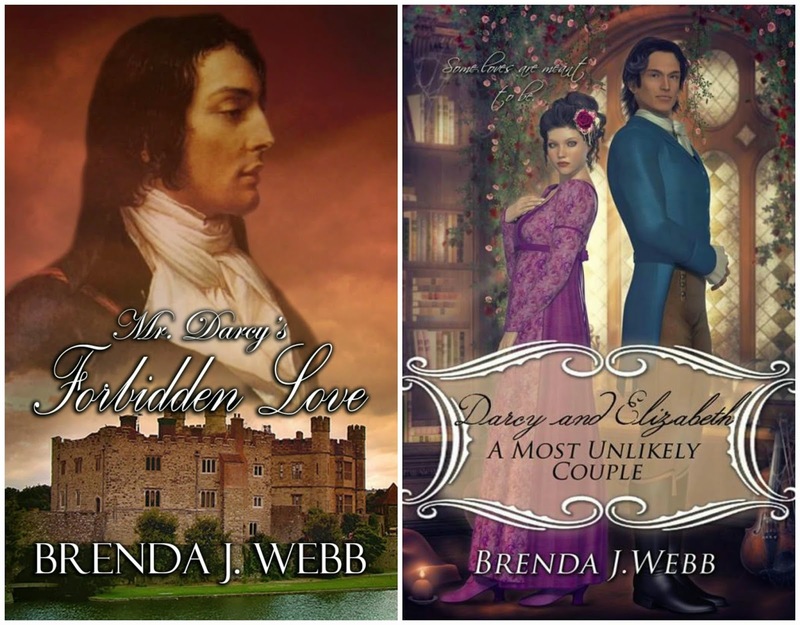 If you already have this book Brenda has very kindly offered a choice of her other books, instead, Mr Darcy's Forbidden Love, or her new book A Most Unlikely Couple, which is due out in October. Many thanks to Brenda for offering this generous giveaway! Just finished reading Brenda Webb's "An Honorable Man" which I thoroughly enjoyed. The story presented a different view on the Darcy Elizabeth relationship showing her to be concerned and cautious before involving him in a dangerous situation. I would very much like to read either of her other novels "Forbidden Love" or the yet to be released "A Most Unlikely Couple." Thanks, Ceri, for the opportunity. Thanks for your comment RS, but please can you leave a way for me to contact you should you win? Nobody else wanted to buy the others Vesper! Or I bet she would have sold them too! I have enjoyed this book as an eBook. I have thoroughly enjoyed this book and have reread it a few rimes as well as FORBIDDEN LOVE. I would love to have this as a print book. Thank you for the generous giveaway Brenda & Ceri. Your review makes me want to re-read An Honorable Man. I do have it on my kindle, so I'd love to have either Forbidden Love (been on my tbr for too long!) or A Most Unlikely Couple. Thank you for your replies and Ceri for giving me the opportunity to do a giveaway. It is humbling to know that people have read my book and would like a copy of it or a copy of another of my books. Writing is something that is made more enjoyable when people seem to like what you do. It's hard to imagine Darcy & Elizabeth with anyone else but each other but it's sure make for a great story. I've read An Honourable Man already and it's definitely a more gothic take on the story, as you so rightly said in your review, Ceri. I certainly didn't want to stop reading as I wanted to know what was going to happen next. Anyone who hasn't read this yet, and who doesn't mind the story departing quite widely from the original, should give this a go. It's not giving away any spoilers, I'm sure, to say that we do get our HEA eventually. The journey there is just somewhat different! As I already have a copy, I'd love to be entered for one of Brenda's other books, in paperback preferably. Wow, thanks for the generous giveaway, Brenda and Ceri. I've not read any books by Brenda Webb yet so hopefully I will win Fitzwilliam Darcy, An Honourable Man. I'm interntional btw. I've read Mr Darcy's Forbidden Love and I love it so I am very happy to have the opportunity to win a novel of the same author!! Lol...Darcy, Darcy, Darcy. While not a huge fan of Mr. D, I'm interested in reading the book. Cheers and thx! rearadmiral00 (at) gmail (dot) com. Hi Kirk! I will confess, Mr Darcy is my favourite, I have to love a man who is willing to change for the better, it's a very attractive quality! Who is your favourite Austen hero then? Mr Knightley? Brenda is offering a choice of her other books too, including the new one. Would you like to enter to win one of those instead Jen? Lizzy bagged a count? I'm feeling shades of the Mysteries of Udolpho, here (please tell me there are some Northanger Abbey references! Either way, I would love to be entered to win a free copy. One can never have enough Austen-related re-tellings and re-imaginings. I keep meaning to read The Mysteries of Udolpho! I'll have to plan it in one of these days. Thanks for your comment. You should read it! Northanger Abbey is hilarious when you get all of the jokes and references. Oh, I LOVE this book! It's one of my favorite P&P variants. The love between Darcy & Lizzy is so palpable. Just thinking about the emotions this book evoked in me is making me want to read it yet again. I have the ebook on my Kindle, but I would love to own a print copy. Thank for doing this awesome giveaway Brenda & Ceri. I haven't read any of your books as yet, but I look forward to it! They all sound very interesting!